Circa 1905. 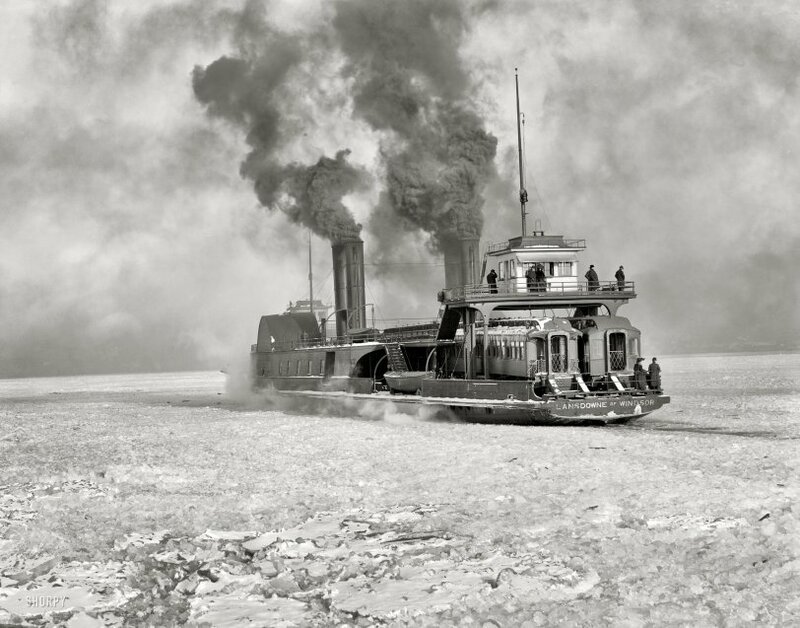 "Grand Trunk car ferry crossing the Detroit River in winter." 8x10 inch dry plate glass negative, Detroit Publishing Company. View full size. Submitted by MaxCohoon on Wed, 03/16/2011 - 8:20am. Submitted by gblawson on Thu, 03/03/2011 - 5:25am. Some interesting information and illustrations here. Seems there are examples at his museum, and a few in other countries. Submitted by dt532 on Wed, 03/02/2011 - 11:20pm. Question for the boat engineers. It seems that a lot of the inland vessels back then used paddlewheels. What is the advantage of a paddlewheel over a screw? Why were they so popular then and not now? And why are some sidewheelers and some sternwheelers? Submitted by switzarch on Wed, 03/02/2011 - 5:37pm. That's what I'd pay to ride in one of those Obervation Cars. It must have been truly exciting to be in one of those thundering along at about 80 mph, watching the world rush by. Shame they're lost; were any saved? Submitted by Brent on Thu, 03/03/2011 - 12:53pm. The observation cars on the photo of the Lansdowne as a restaurant photo that bigguy1960 posted are a pair of Milwaukee Road Skytop Observation Cars that were built in 1949 when they re-equipped their Hiawatha trains. Ten of these were built, six in the original design with the extended skypod observation area and four with a shortened skypod; the latter class are the cars on the Lansdowne. They were withdrawn from service in 1970. Apparently the railcars were undamaged when the Lansdowne sank at Erie, but couldn't be salvaged intact and were each cut into three pieces. There was reportedly an effort underway to salvage them to make one complete car out of the two but I have no knowledge of whether this was carried out. Update: To answer swissarch's question, several of the ten Skytop cars have survived. One that I know of for sure, Cedar Rapids, is operational and sometimes used on excursions. She would be a true sister of the cars on the Lansdowne. The car is owned by a group called "Friends of 261" and can even be rented for whatever reason. At least two other cars Coffee Creek and Dell Rapids either still exist or are in the process of being restored. Submitted by carpenterbee on Wed, 03/02/2011 - 4:54pm. Try as I might I can not locate this image on the LOC site. Did you obtain it from them? I'd like to play with the full size Tiff copy they usually have on the site. Submitted by William Lafferty on Wed, 03/02/2011 - 10:20am. was towed from Erie to Buffalo in 2008 and broken up there that year. Submitted by Crystal on Wed, 03/02/2011 - 8:53am. The lack of pollution control back in the day is startling. The amount of thick black smoke would certainly not be tolerated today. It would take several more years until emission control standards would be adopted. Submitted by bigguy1960 on Wed, 03/02/2011 - 7:46am. 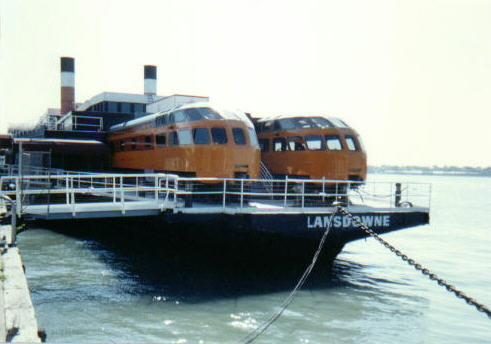 Pictures of the Lansdowne as a floating restaurant on the Detroit waterfront are hard to come by (see below). She lost one side wheel and a pair of funnels, and had a steel structure built on top with two old railroad observation cars at one end. The interiors (and exteriors) were just cheap 1980s ersatz "luxury," with little connection or even acknowledgment of her Victorian past. It could have been built on any old barge and been the same. By the end of its restaurant career, it was dirty, poorly managed and had awful food. Submitted by Katella Gate on Tue, 03/01/2011 - 11:07pm. Looking at those wheelhouses, I don't think I've ever seen a ship built with a mansard roof. Submitted by gkmcpherson on Tue, 03/01/2011 - 9:25pm. 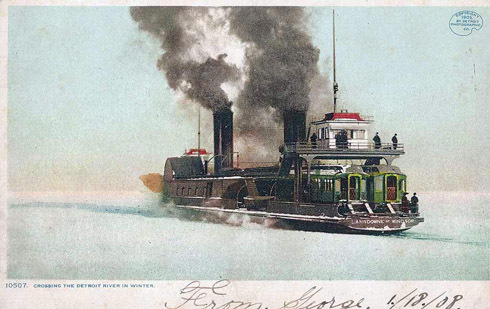 Nice shot of the railroad ferries that plied many waters on the Great Lakes. Similar ships were used, for instance, on the Straits of Mackinac for decades. The picture is a great illustration of one of the real innovations in passenger cars - vestibules at the ends of the cars that allowed passengers to move from car to car through the train while it was in motion. Better yet, the photo shows the car on the left with the earlier, so-called open vestibule (still had some open platform) while the car on the right was the newer, fully-closed vestibule. Not only did the vestibules make moving between cars easier but the Pullman Company (which invented and patented them) tried to convince passengers that they strengthened the cars in the event of a collision. The tighter coupling was said to prevent the cars from telescoping into one another. This had been a real problem in the old open-platform cars. It was such a great idea that the designs were quickly knocked off by the other passenger car companies and it became the standard of the industry. Submitted by Mr Mel on Tue, 03/01/2011 - 8:09pm. The couple on the Stern may be setting the scene for a film to be made some 90 years later. The Director electing to use a younger pair and move them to the front of the ship, many of the cast and the movie itself would eventually win Oscars and VHS tapes would be handed out to purchasers of Happy Meals. Submitted by berserkley on Tue, 03/01/2011 - 7:13pm. Just what I was thinking, Jeff! Very steampunk looking. Great shot. Submitted by Clare on Tue, 03/01/2011 - 7:12pm. I am planning on building a model of the Lansdowne and the definition on this photo shows detail I have not seen before. The Lansdowne was built in 1884 for the Grand Trunk Railway. She was powered by a pair of horizontal low pressure engines working at 55 psi, until some engineer forgot to drain one on startup in 1971 and blew the cylinder head off it, instantly converting it to a barge. She was pushed by a tug for a few years then laid up and converted to a restaurant on the Detroit waterfront. Her hulk still rests partially submerged in Erie, PA. Being a sidewheeler with each paddle capable of independent operation, she was considered a very good ice boat. Submitted by SignpainterJeff on Tue, 03/01/2011 - 5:09pm. What a captivating and dramatic riverscape. Maybe the League of Extraordinary Gentlemen are heading out on another adventure? Submitted by Talitha Clementine on Tue, 03/01/2011 - 3:45pm. But what a smoke screen those poor passengers had to endure. I wonder what sort of sturdy craft the photographer was perched on in order to "get the shot." The hardy occupants of the coach nearest the camera had apparently already weathered a nasty storm on the rails; that car's frosted like a wedding cake! Submitted by Green Machine on Tue, 03/01/2011 - 2:31pm. "What was that, Hon? You want me to sit with you in the rail car? No thanks. I think I'll just stay out here in the lifeboat if you don't mind."